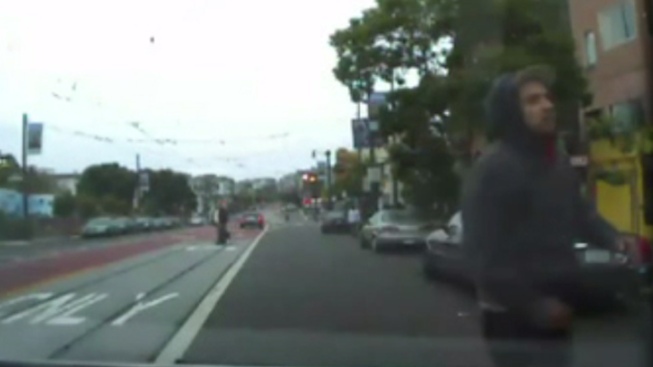 San Francisco police have released taxi dashcam video of a person of interest in the case of the gay activist who was found brutally beaten and left for dead in San Francisco’s Castro District. Police are actively searching for the person responsible for fatally beating Bryan Higgins, whom passers-by found seriously injured around 7 a.m. on Aug. 10 at the corner of Church and Duboce streets, SFPD spokesperson Albie Esparza said Thursday. Higgins was taken to San Francisco General Hospital but was taken off life support three days later. The video footage from a passing taxi shows a man in a dark gray hooded sweatshirt with a red shirt underneath and a baseball cap. Police also released a still photo showing the person of interest wearing a red shirt. Police are investigating Higgins' death as a homicide and have not yet made any arrests. Higgins, 31, also used the name "Feather Lynn" and was a member of the Radical Faeries, a movement of gay and queer-identified men searching for a spiritual dimension to their sexuality. Police had originally not known his identity, but a photo released to the public helped to identify him. Higgins described himself as a "starving artist" who worked at Rosenburg's Delicatessan at 276 Noe Street on his Facebook page. He is originally from Kalamazoo, Michigan. At a prayer circle held at Duboce Park on the day his family removed him from life support, friends described Higgins as having a big impact on the local LGBT community. Anyone with information on the case should contact SFPD at 415-575-4444.